Today the world’s leading e-commerce, technology and social media companies are joining forces with Google and WWF to render online platforms and apps inoperable for wildlife traffickers to trade in endangered species. In a historic movement 21 tech companies from North America, Asia, Europe, and Africa have come together as the first-ever Global Coalition to End Wildlife Trafficking Online. As members of this coalition, tech companies pledge to work together to collectively reduce wildlife trafficking across platforms by 80% by 2020. There’s no denying the internet has changed the world as we knew it, for both the good and the bad. This is also true of the conservation world. Nowadays, it takes only a few minutes to find endangered wildlife for sale online, including everything from elephant ivory trinkets to live tiger cubs. These sales are almost always illegal and in breach of a site’s rules. Not only this, people buying these products are knowingly or unknowingly contributing to the fourth largest global trade crime. The criminal syndicates behind the illegal wildlife trade are often the same as those also trafficking people, arms and drugs. The illegal wildlife trade is a serious issue, comprising of a criminal network estimated to be worth as much as $20 billion annually. It’s one of the greatest threats to wildlife with more than 20,000 elephants illegally killed each year for trade in their tusks, and nearly 3 rhinos poached each day in South Africa alone for their horns. A pangolin is snatched from the wild on average every five minutes and many big cat populations remain perilously low with poaching recognized as one of the main drivers behind dwindling numbers. Countless species are under threat from trafficking, accelerated by online consumers, most of whom are unaware that the product they are buying could be devastating species populations and funding crime gangs. 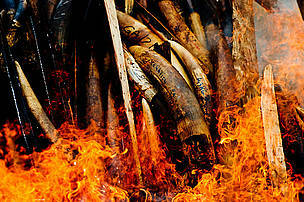 However, today the world’s leading e-commerce, technology and social media companies are joining forces with Google and WWF to render online platforms and apps inoperable for wildlife traffickers to trade in endangered species. In a historic movement 21 tech companies from North America, Asia, Europe, and Africa have come together as the first-ever Global Coalition to End Wildlife Trafficking Online. As members of this coalition, tech companies pledge to work together to collectively reduce wildlife trafficking across platforms by 80% by 2020. As governments become tougher on closing and enforcing physical markets for wildlife trade, more traders and consumers are moving online. This makes it more critical than ever to ensure social media and e-commerce platforms cannot be exploited by loopholes created by wildlife traffickers. Addressing this issue as a coalition with many of the most influential industry leaders is a significant milestone in ending online wildlife trafficking. We all have a role to play in ensuring that a world without rhinos, elephants, tigers and thousands of other creatures does not become a reality. Fight against illegal wildlife trade!